Even without knowing the term “dry eye” or “Dry Eye Syndrome“, if you suffer from it, then you are all too familiar with the soreness, discomfort, and even the constant misery that can come with dry eyes. Fortunately, there is a Dallas Dry Eye Specialist seeking to bring relief and healing from Dry Eyes in its many forms to patients from the state of State. With Dr. Joey D. Tran, O.D. 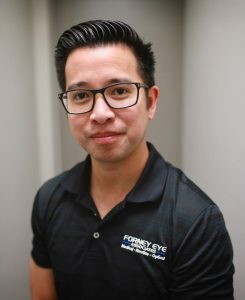 at the helm, Forney Eye Associates Dry Eye Center, in Dallas, specializes in treating the entire range of Dry Eye Syndrome, from mild to severe. Whether it’s an occasional irritant or a debilitating daily problem, we’re here to help, with years of experience specializing in treating dry eyes. Forney Eye Associates Dry Eye Center uses the most advanced diagnostic equipment and tools to quickly and accurately pinpoint the cause and type of dry eye problem you’re suffering from. We don’t just throw any old drops at you either. We provide custom, tailored treatment plans designed to maximize the relief of your dry eye symptoms AND treat the underlying cause of your discomfort. Even without knowing the term “dry eye” or “Dry Eye Syndrome“, if you suffer from it, then you are all too familiar with the soreness, discomfort, and sometimes even the constant misery that can come with dry eyes. Fortunately, there is a Dallas Dry Eye Specialist seeking to bring relief and healing from Dry Eyes in its many forms to patients from the state of Texas. With Dr. Joey D. Tran, O.D. at the helm, the Dallas Forney Eye Associates Dry Eye Center specializes in treating the gamut of dry eyes. Whether it’s an occasional irritant or a debilitating daily problem, we’re here to help, with years of experience specializing in treating dry eyes. The Forney Eye Associates Dry Eye Center uses the most advanced diagnostic equipment and tools to quickly and accurately pinpoint the cause and type of dry eye problem you’re suffering from. We don’t just throw any old drops at you either. We provide custom, tailored treatment plans designed to maximize the relief of your dry eye symptoms AND treat the underlying cause of your discomfort. Dry eyes, or, Dry Eye Syndrome, is a complex condition that can have multiple causes but tends to share common symptoms. Our optometrist, Dr. Joey D. Tran, O.D., uses the latest technology to assess the cause of your dry eye symptoms, in order to provide the best possible care. The water provides moisture and keeps the eyes clean while simultaneously delivering oxygen to the tissue of the eyes. The lipids (oils) produced by the meibomian glands provide essential lubrication and control the rate at which the water of tears evaporates. The time it takes for the tear film to evaporate is referred to as the tear-film break-up time. The mucus in tears helps to keep the tear-film evenly distributed and stable. When someone is suffering from Dry Eye Syndrome, one or more of these factors is off and your eyes suffer for it. In 85% of cases, Meibomian Gland Disorder is responsible for dry eye syndrome. Our eyes have glands which produce the lipids (fatty oils) essential for proper lubrication. These are referred to as the meibomian glands. The blockage or dysfunction of these glands causes a condition known as Meibomian Gland Disorder. This condition is responsible for roughly 85% of all instances of Dry Eye Syndrome. Blepharitis is related to Dry Eye Syndrome and is often a contributing cause or a parallel condition. It involves inflamed eyelids, particularly where the eyelashes grow. Blepharitis is usually caused by bacterial infections or other skin problems resulting in similar symptoms to dry eye syndrome in general. A low supply of tears is a less common cause of Dry Eye Syndrome. This can be caused by a number of factors such as medication and certain health conditions, resulting in Dry eyes. As we age, we experience hormonal changes. These changes are known to cause or contribute to dry eyes. While this is true of both men and women, it seems that women over 50 are particularly more prone to developing dry eye symptoms. Pregnancy is also known to contribute to or exacerbate dry eye syndrome. Poor cleaning habits, not changing the contact often enough, and sleeping in contact lenses can contribute to dry eyes. However, even for those who take proper care with their contacts, they can still be a contributing cause of dry eyes. In fact, one of the main reasons people discontinue contact lens usage is due to dry eyes. The good news is there have been major improvements across all the brands with special contacts that are aimed at preventing dry eye symptoms. Various diseases contribute to, or even cause, dry eyes. Autoimmune diseases are a known factor. Rheumatoid arthritis and Sjogren’s syndrome – a common symptom that rheumatologists treat can also contribute to dry eyes. Diabetics or those with Glaucoma that requires medication are also more likely to have dry eye syndrome. As with everything, proper balanced diet and exercise are important in preventing or managing dry eye syndrome. There are two specific activities that relate directly to Dry Eyes. Does Staring At A Screen Cause Dry Eye? Continuous staring at a fixed object, such as a phone or computer screen, usually results in a decreased blink rate. The lack of blinking actually causes the eyes not to replenish the tears often enough. The meibomian glands, therefore, can become blocked or even atrophy and die. Prolonged And Continuous Use Of Digital Devices Is Thought To Be The Likely Culprit In The Significant Increase Of Dry Eye Syndrome Throughout The General Population. Does Drinking More Water Help With Dry Eye? The main component of tears is water. Most of us don’t drink enough water. If you are dehydrated or not drinking enough, then you may not produce enough tears to keep your eyes moist. Soft drinks and other caffeinated drinks like coffee and tea may feel like they quench your thirst, but they actually dehydrate the body. Your body needs water to prevent dry eyes symptoms. How Can I Improve My Lifestyle To Prevent And Treat Dry Eye Syndrome? The first recommendation is to prevent dry eye symptoms before they start, and to address lifestyle factors that may be making it worse. Blink a lot and drink a lot. Avoid eye irritants, use lubricating eye drops if you are taking medication that puts you at risk for dry eye. Over the counter eye drops for dry eye are widely available. Maintain a healthy lifestyle with a focus on vitamins like Omega 3. One of the most common treatments we recommend is simple. Just BLINK! Blink regularly. Good, hard, fully closed blinks help restore the tear film. The 20-20-20 Rule! During prolonged computer or digital device use, take 20 seconds, every 20 minutes, to look at an object at a distance of at least 20 feet away. This gives your eyes a needed rest. Drink adequately. Women need at least 91 oz. of water a day. Men need even more. Poor intake of water directly contributes to a poor supply of tears, especially in hot and dry conditions. A healthy diet is always essential for maintaining optimal health. Omega 3 fatty acids have been conclusively shown to help maintain good vision and eye health, as well as decrease dry eyes symptoms. Fish and flax are good natural sources of Omega 3 fatty acids, also available in tablet/supplement form. There are even formulations specific for dry eyes. These usually consist of Omega 3 with DHA from flaxseed oil and includes vitamin C, vitamin E, Vitamin B6, magnesium, and a variety of other vitamins specifically geared toward patients with dry eyes. Our Dry Eye doctor can recommend one or more of these for your specific needs. How Is Dry Eye Syndrome Diagnosed? TearLab ― What Exactly Goes Into Healthy Tears? How effectively are you blinking? How often? Are your tear ducts lined up properly? What’s the osmolarity of your tears? How fast do your tears break down? What is your tear volume? Do your tear ducts line up properly? What shape are your meibomian glands in? Are they blocked? Dirty? Infected? Our dry eye doctor will also conduct an in-depth assessment of indicators for other diseases and health problems which might be contributing factors to your dry eyes. We then develop a personalized treatment plan based on what we find, and ongoing based on what's working for you. On every patient questionnaire, we ask if you are suffering from any of the typical symptoms of dry eyes. Do your eyes feel gritty? Sore? Do you feel like something is in your eye or that you just don't seem to have any tears? If you report symptoms of dry eye, or appear to exhibit those symptoms, then we recommend beginning the dry eye exam process, which is quick, easy, and painless. The first thing we want to check is the stability of the tear-film. We use TearLab to test the osmolarity of your tears― that is, the relative concentrations of salts, water, and lipids (fatty oils). These lipids are produced by the meibomian glands. Most cases of dry eyes occur where there is a problem with these glands. They could be blocked, atrophied, or otherwise damaged. If your tears evaporate too quickly (which causes burning), it's usually caused by a lack of these lipids. A strong imbalance between the osmolarity of one eye vs. the other is a strong indication that someone has dry eye disease. Depending on the results of the TearLab, our Dallas Dry Eye specialist will also want to see if the overall volume of tears could be the problem. In some cases, the meibomian glands are producing the lipids needed for lubrication, but there just isn't enough of the aqueous layer (this means tears) to spread it around effectively. In order to test this, our optometrist will place a thin piece of red thread draped over the eyes for a few seconds in order to measure how wet the eye gets and comparing the differential between the eyes. Another tool in the arsenal of our dry eyes experts is InflammaDry, a specialized diagnostic tool which measures whether or not a patient has elevated levels of MMP-9 in their tears from the inner lining of the lower eyelid. MMP-9 is a protein which indicates inflammation, which is fairly common for anyone suffering from dry eyes. Our eye doctor will typically prescribe steroids in order to get the eye inflammation under control. Our dry eye doctor will also test your tear breakup time. Sometimes, tears don't last long enough to work effectively. In order to test this, we use a fluorescein orange dye to test the breakup time (as well as any other corneal diseases, conditions, or foreign bodies). Using a small blotting paper, the optometrist will lightly touch your eye. As you blink, the dye spreads and gently coats the tear film covering the cornea. Using a blue light (the dye is orange), problems will be revealed to the eye doctor as green. How Is Dry Eye Treated? Depending on the underlying cause or causes of your dry eyes, as well as the severity, our Dallas Dry Eye Specialist will develop a custom treatment plan that is tailored to your specific needs. The following are some of the treatment options in our arsenal for treating dry eyes. For those with tear-film insufficiency, artificial tears are a basic solution that literally introduce more tears into your eyes in the form of non-medicated (or lightly medicated) drops. While not enough for a severe case, these can help maintain overall hydration of the eyes. For cases of severe or chronic tear-film insufficiency, our [location] Dry Eye doctors will sometimes use punctal plugs. These are small devices that are inserted into the tear ducts to slow or even block the drainage of tears. This increases the tear-film and moisture present in the eyes. In most cases, the procedure is quick, painless, and uneventful. Find out if punctal plugs are right for you. For mild to moderate dry eyes resulting from Meibomian Gland Disorder or Blepharitis, a hot compress or eye mask is helpful in alleviating the symptoms. The warmth of the mask stimulates the oil glands to open up, allowing for natural lubrication of your eye. This is a revolutionary treatment that has been developed in the past few years for treating severe and chronic cases of dry eye. Amniotic membranes are collected during elective cesarean births from the placenta. Amniotic membranes protect and nurture the baby in the womb. When placed over the eye, this membrane dramatically heals the eye surface which has been damaged by prolonged dry eyes. Absolutely no sale of body parts is involved, and absolutely NO harm comes to the infant or the mother in extraction. The results of using an amniotic membrane to treat dry eye are dramatic. At our dry eye clinic, we make use of both wet and dry membranes, which differ slightly in use. Both types offer significant, dramatic, and real healing and relief for inflamed and scarred eyes due to dry eyes. The use of amniotic membranes is a game-changer in the treatment of dry eyes. The "Wet" amniotic membrane is a thin membrane held together by a small plastic ring. Applied directly to the eye, the ring holds it in place right where the eyelid meets the sclera (the white part) of the eye. The healing from this method is very fast. Usually, the membrane needs to be worn for no more than a week before dramatic improvement occurs. Looking more like a thin dry bit of tiny corrugated cardboard, the dry membrane is placed right on the cornea and held in place with something called a "bandage contact lens" on top. In cases of chronic dry eye, we often see patients who have a decreased ability to produce tears. This occurs because of the constant inflammation they experience. Unlike artificial tears, Restasis and Xiidra are medicated prescription eye drops which are both proven to increase the eye’s ability to make its own tears. Instead of having to constantly replenish your eyes’ moisture, with Restasis or Xiidra you are actually stimulating your eyes to make more tears over time. When do I need prescription eye drops and when is a dietary supplement enough? Typically, Restasis or Xiidra is used for chronic cases, while a recommended omega-3 supplement usually can and should be used in most cases even as a preventative measure and to maintain optimal eye health. Our eye doctors are experts in treating dry eye syndrome and will diagnose and guide you through the right treatment plan for you. You don’t have to continue to suffer. Book an appointment with our Dallas dry eye specialist today. Restasis has been in use for a number of years. It is an eye drop that is used twice a day. It’s the teardrop form of cyclosporine, an autoimmune suppressant which is prescribed for many chronic conditions, and it has been found to alleviate the symptoms of dry eyes by reducing the inflammation and increasing tear production. However, Restasis doesn’t necessarily help to improve the outflow of the oil that needs to be produced on top of the tears so that the tears don’t evaporate. Right now some of the studies are suggesting that over 50% of people with dry eyes actually have meibomian gland dysfunction. So, if the first lines of treatment are failing to manage dry eye symptoms, consider more rigorous treatments for dry eyes and blepharitis. Restasis also has side effects, with some patients experiencing burning and discomfort. Xiidra is a newer drug that has recently received FDA approval for the treatment of Dry Eyes. Clinical studies have shown it to be significantly effective in alleviating symptoms, and it works far faster than Restasis, providing significant relief within as little as 2 weeks without the side effects of Restasis. However, the long-term benefits for dry eyes have yet to be conclusively proven. Nonetheless, it is considered a very safe drug. Scleral lenses are a special contact lens that is large. It sits on the sclera, rather than the cornea, leaving a pocket of space over the cornea. In our Dallas eye clinic, our optometrists use scleral lenses to treat a variety of eye conditions, including keratoconus and for people with sensitivity to regular contacts. Scleral lenses are also highly useful in treating Dry Eyes. Studies have shown that the use of scleral lenses is effective in treating moderate to severe dry eyes. In more than 50% of cases, patients fitted with scleral lenses report reduced discomfort and dry eye symptoms, decreased use of artificial tears and improved visual acuity. Alipour F, Kheirkhah A, Behrouz M. Use of mini-scleral contact lenses in moderate to severe dry eye. Cont Lens Anterior Eye. 2012 Dec;35(6):272-6. 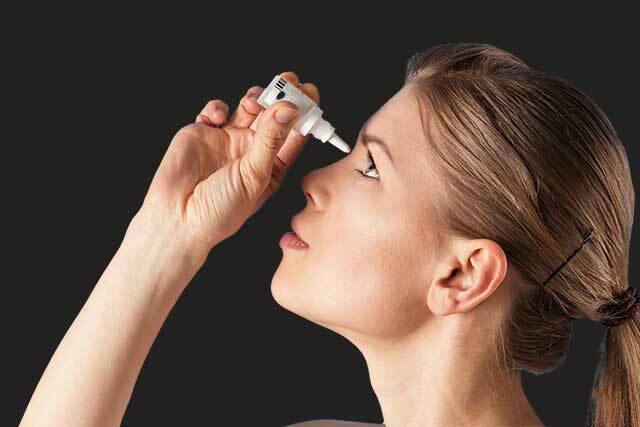 A new entry on the market, Allergan's product rethinks the traditional approach to temporary dry eye relief. Using a small nasal spray like device, True Tears stimulates a nerve in the nasal cavity which tells the brain to produce more tears. While not a treatment of the underlying condition, True Tear is an effective and natural tool for temporary dry eye relief. BlephEx is a painless in-practice procedure performed by our Dry Eye Specialist to treat blepharitis, the infection, and inflammation of the eyelids which is a common cause of severe dry eyes. In our Dallas Dry Eye clinic, we make use of the revolutionary new patented BlephEx handpiece, which is used to very precisely spin a medical grade micro-sponge along the edge of your eyelids and lashes, removing scurf and debris and exfoliating your eyelids. The patented micro-sponge is disposable and a clean one is used for each individual eyelid so bacteria are not spread between the lids. The eyes are rinsed well afterward. The procedure lasts about 6 -8 minutes and is well tolerated. Most patients simply report a tickling sensation. A numbing drop is usually placed in each eye prior to treatment for increased comfort. After the procedure, the patient is instructed on how to maintain their clean eyelids with regular nightly lid hygiene. Since home treatments are only semi-effective, the procedure is typically repeated at 4-6 month intervals. There are many ways to treat dry eye. The first recommendation is to prevent dry eye symptoms before they start, and to address lifestyle factors that may be making it worse. Extraordinary office! I’ve been seeing Dr. Tran for all my eye care needs since they opened and I never leave unimpressed. 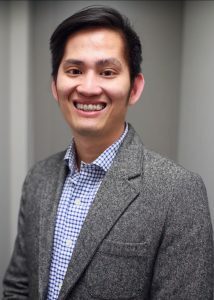 Dr. Tran is very thorough and has an equally knowledgeable team, all with great personalities! The office itself is extremely nice with a large selection of frames to fit your lifestyle/ preference. Definitely recommend!!!!!!! I love this place!! The staff is very friendly and helpful. The doctor is amazing! My husband injured his eye and they seen him right away. Dr. Tran explained everything and made sure we understood and made sure the antibiotic was affordable.Not only that the next day we received a personal email from the doctor checking on him and told us we could reach out to him if we needed him!!! We did in fact have a concern a couple of days later and emailed him, he responded in just a couple of hours and assured us of our concern!!! My kids, my husband and I all go here and recommend this place.You guys need to switch to him! Oh and the glasses are affordable too! Best eye doctor ever! I found this office on google and gave them a shot. They had excellent service and I was very pleased with my experience. I have never been able to wear contacts. They took the time to help me try several different pairs and got me in a pair that fits well. The office is clean and the staff was very courteous. Great eye exam. The doctor was thorough and patient with my questions. He is very upbeat and an all around nice guy. Front office staff was sweet and the office was clean. Scheduling a new patient appointment was a breeze. The doctor thought I would like a different brand of contact lens better than the ones I was wearing. They are much more comfortable than my old pair. Highly recommend! We will be closing at 1pm on Monday, April 22nd. We are open 2 Saturdays per month. Please call for details.